Data that are distributed throughout 3-dimensional space are at the core of geoscience. Geologists, atmospheric scientists, and oceanographers all routinely explore and analyze data shown on maps. In addition, geoscientists easily combine evidence from a wide range scales—extracting information about the uplift of mountain ranges from the textures seen in a thin section for example, or integrating data from individual ocean buoys to determine currents and patterns across the entire Pacific Ocean. This is the concept map from Manduca and Kastens, 2012. Reuse: Permission granted by GSA to use this image. This is a spatial skill... Many times, students are required to understand spatial visual information contained within abstract visualizations. For some people, understanding spatial representations can be a barrier to becoming a successful geoscientist. This barrier can be overcome through good instruction and practice. 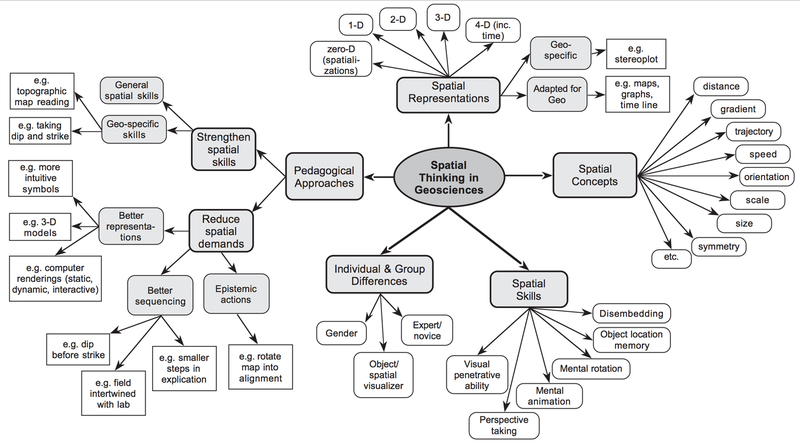 This concept map (Manduca and Kastens, 2012) illustrates the domain of spatial thinking in the geosciences. 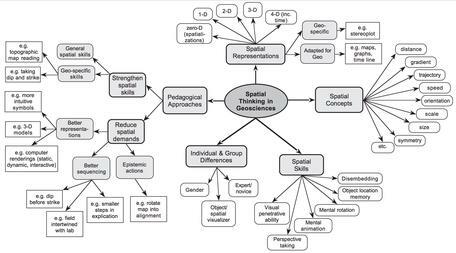 Of primary interest here are the nodes of spatial skills, which discusses the habits of mind utilized by geoscientists to think over a broad range of spatial scales, and pedagogical approaches, which describes strategies for and impediments to teaching spatial skills. You can download text to accompany the concept map (Acrobat (PDF) 94kB Aug4 13). Students will choose an appropriate orientation to draw a cross-section from a map (a geologic map, or sea-surface temperature, or earthquake distribution, for example). Assessment: Ask students to analyze existing published maps for their cross-section locations. As a group, describe the typical characteristics of these cross-section lines. Then give students multiple opportunities to practice selecting the location using increasingly complex maps where they must choose the orientation of a cross-section that will highlight the important features. Ask them to sketch the key features of the cross-sections. Assessment: Give students several maps of the same area with similar data sets. Work with them to analyze and compare the data, introducing ways to describe the data patterns (asymmetric, tightly clustered, etc.). Give the students a new map and ask them to do the same thing on their own. Earth Science Big Idea 3. Earth is a complex system of interacting rock, water, air, and life. Climate Literacy Essential Principle 4. Climate varies over space and time through both natural and man-made processes. Atmospheric Science Essential Principle 4. Earth's atmosphere changes over time and space, giving rise to weather and climate. Committee on the Support for Thinking Spatially, 2006, Learning to Think Spatially: GIS as a support system in the K-12 curriculum ; National Academies Press, Washington, D.C. Permission granted by GSA to use this image.